The Chambers House is a historic log home recently renovated and decorated with a mixture of antiques and new furniture. The elegant home offers fireplaces in some rooms, private and semi-private bathrooms, sitting rooms, and a formal dining-room -- unless you would rather have breakfast in bed! 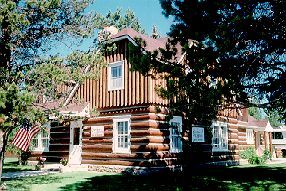 The Chambers House Bed and Breakfastis located in downtown Pinedale, Wyoming, a small western town. The House is close to restaurants and shops. Pinedale is the gateway to Bridger Teton National Forest and the Wind River Mountains. The landscape abounds with outdoor activities from picnics and swimming in nearby lakes, fly-fishing in the mountain streams, to hiking and horseback rides through the wilderness. Come in the winter too! There's cross-country skiing, snowmobiling, and ice-fishing. This and other Pinedale Bed and Breakfast Inns can be found here in The Register.